Seven is the most viscerally frightening and disturbing homicidal-maniac picture since The Silence of the Lambs. The film is based on an idea that’s both gruesome and ingenious. A serial killer (Kevin Spacey) forces each of his victims to die by acting out one of the seven deadly sins. The murder scene is then artfully arranged into a grotesque tableau, a graphic illustration of each mortal vice. From the jittery opening credits to the horrifying and seemingly inescapable concluding twist, director David Fincher immerses us in a murky urban twilight where everything seems to be rotting, rusting, or molding; the air is cold and heavy with dread. 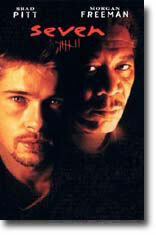 David Mills (Brad Pitt) and William Somerset (Morgan Freeman) are the detectives who skillfully track down the killer, all the while unaware that he has been closing in on them, as well. The acting is phenomenal, but it is director Fincher and the ominous, overwhelmingly oppressive atmosphere of doom that he creates that are the real stars of the film. Seven is a very disturbing thriller about a serial killer, John Doe (Spacey), killing people via examples of the seven deadly sins – gluttony, greed, sloth, lust, pride, envy and wrath. The story begins with Detective Mills being assigned to Detective Somerset at the NYPD. Somerset is due to retire at the end of the week, and Mills is moving up in the world, and is to take Somerset’s place. This is a very unsettling movie. It will keep you enthralled and glued to your seat for the entire 127 minutes. This is a movie with an unexpected ending that is absolutely unpredictable and which many people will find repulsive. However, for a glimpse into the mind of a psychopath, there is no movie better than this. Character to watch: Brad Pitt as Detective David Mills.